Number one rated shaky head. The Giggy Head design is extremely snag resistent, an important factor when using light line. 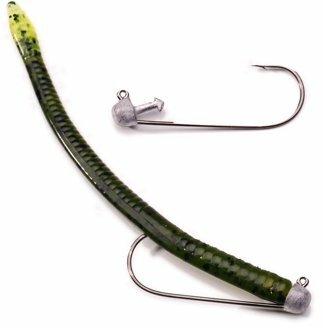 Molded on a 5/0 quality Gamakatsu hook ensures the best hook set possible. The Giggy Head keeper design allows the bait to break free from the head enabling a more solid hook set than a jig head with a screw keeper. Remember you are fishing with light line, light rods, and deeper water. The combination of the jig head design and Gamakatsu hooks will result in more landed fish. 5/0 Giggy Heads, 4 per pack.